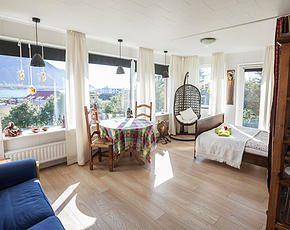 Upstairs in Blómasetrið you will find a cosy guesthouse with four bedrooms. Run in the proprietor’s home the guesthouse gives a warm and welcoming feeling. This room has two single beds in a light and welcoming room. Small and simple but has everything you need. 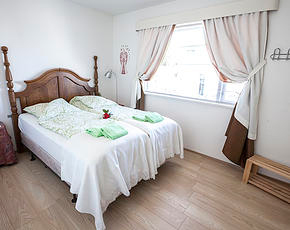 Ideal for a couple, this room has a double bed and is decorated in a charming manner. A family room suitable for 3-5 persons. 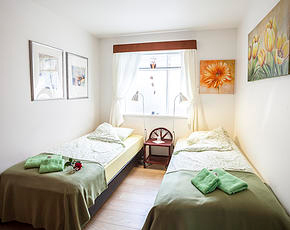 In the room you will find a double bed, a single bed and a sofabed that sleeps two. Spacious room with a nice view that comes along with a table and chairs. On the ground floor of the house you will find Café Kyrrð and Blómasetrið with it’s delicious coffee and tea selection and simple, but tasteful meals. You will have access to a kitchen that has all the kitchen supplies you need, and a newly renovated bathroom.